The handsome Araripe Manakin was described to science only about 20 years ago! We stand an excellent chance of seeing it just as well as we did when this one was photographed by participant Steve James on our 2016 tour! "Northeast Brazil" is a really big piece of turf. Geographically, it covers all of that chunk sticking out into the Atlantic, but biogeographically, and specifically in terms of bird distributions, it casts an even greater compass. Thus, from the states of Ceara and Pernambuco thence far to the south and west, where biomes range from humid Atlantic Forest through caatinga and cerrado woodland to the edges of Amazonia, there are one heckuva lot of endemic birds, some of them among the most endangered species on the continent, many of them among the most range-restricted in the world. Would you like to see them all? You bet you would! That's why we pioneered birding tourism in Northeast Brazil over twenty years ago and why we're continuing to expand our (your!) horizons there. 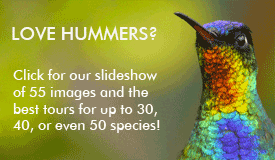 Let's start with White-collared Kite, Lear's Macaw, Hooded Visorbearer, Pygmy Nightjar, Great Xenops, Silvery-cheeked Antshrike, Sincora Antwren, Fringe-backed Fire-eye, Diamantina Tapaculo, Araripe Manakin, Seven-colored Tanager, and White-throated Seedeater among hundreds of others (main tour). Then you can join our separate week-long "Bahia Birding Getaway" tour (see more below) to take on Hook-billed Hermit, Black-capped Screech-Owl, White-winged Potoo, Banded Cotinga, Slender Antbird, Narrow-billed Antwren, Rio de Janeiro Antbird, Band-tailed and Bahia antwrens, Striated Softtail, Pink-legged Graveteiro, Bahia Spinetail, and Bahia Tyrannulet. So, grab your binoculars and pack some light clothes (don't forget your flip-flops) and leave Old Man Winter at your doorstep to join us for a fabulous journey through Northeast Brazil! 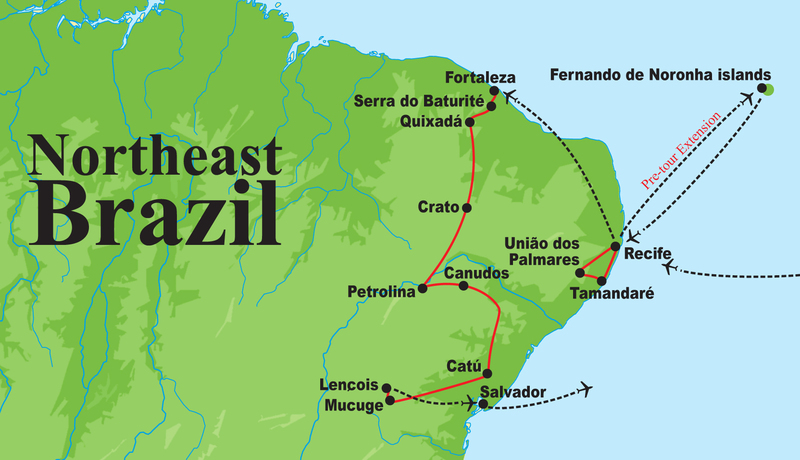 The main tour includes the states of Pernambuco, Alagoas, Ceara, and northern Bahia to end in Salvador. Our Southern Bahia Extension to the southern coastal and interior areas of Bahia visits two areas packed with additional rare birds. SPECIAL NOTE: For 2019, at least, we are offering a second departure of the same itinerary, including the post-tour Southern Bahia Extension. The dates immediately follow those of the first tour. Guides for the first tour will be Bret Whitney and Marcelo Barreiros, with a group of 12 participants. The second tour will be led by Marcelo Barreiros with a group of 8 participants. The second tour will benefit by Marcelo's having lots of fresh stake-outs from the first tour, and it is also somewhat less expensive, due to lower cost of smaller or fewer vehicles at some of the tour venues, and the fact that we will not need to cover a second guide's airfare and caipirinhas. Final bird lists for the two tours are going to be quite similar, and excellent, of course! Good to fine accommodations, easy terrain, warm to hot but dry climate.